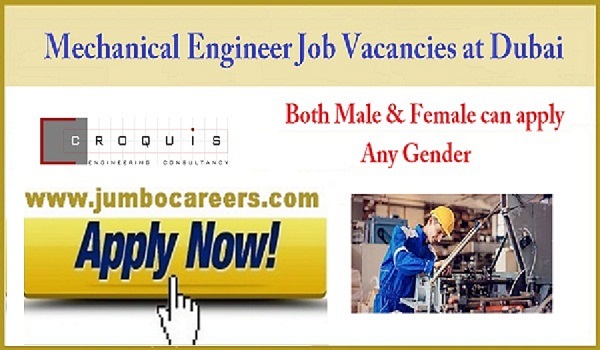 An Engineering consultancy in Dubai Urgently requires experienced Mechanical Engineers. About the company : Croquis is an engineering consultancy firm that has been established in 2012. They proud on quality services, elegant designs, and outstanding engineering work. The team is comprised of visionary leadership management and a wide spectrum of talented architects, engineers with combined experience of over 50 years; striving to provide the best services to exceed customer expectations. They offer a diverse variety of designs and styles that are modern, innovative, and smart. Their clients describe our designs as excellent, contemporary, stylish, and simply elegant..
* Candidate must have experience in designing air cooled and chilled water AC systems and the ability to draft the design using Revit; up to level of detail 300; and utilizing 3-D Revit modeling for mechanical systems. * When hired, the candidate shall prepare for, and pass a qualifying examination; administered by Dubai Municipal Authority to design mechanical, plumbing and fire protection systems for buildings. Experience with Dubai Municipality is preferred. * The Mechanical Engineer candidate is expected to perform his/her own design calculations, Rivet Structural modeling. * The ideal candidate must have excellent verbal and written communication skills in Arabic and English. How to Apply for Mechanical Engineering jobs in Croquis Dubai?